RENT, The musical naturally gives it’s self to a rock nature and from listening to the soundtrack it is easy to tell how much of the energy in the show relies on the fast paced music sung almost throughout. This became the starting point of the Sound Design. From start to finish every sound related choice could effect (and most importantly) the energy of the show. Martin Audio normally find their place in Live Sound, but are slowly creeping into more theatres throughout the UK – Because of Martin Audio’s typical ‘Rock and Roll’ signature sound you find with a lot of the cabinets they manufacture, they seemed like a great choice to go with for RENT. 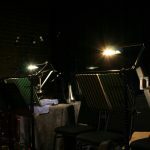 Other theatres such as the ‘Regents Park Theatre’ have also adopted the use of Martin Audio’s MLA (Multi Cellular Array) loudspeakers for musicals of a similar caliber, for instance ‘Jesus Christ Superstar’. The sound system comprised of a stack of 1 x Martin Audio W2 and 1 x Martin Audio X115 each side of the Proscenium. Not a huge a mount of fire power, however in a Theatre holding ~ 200 people, this was ample to give enough level and coverage to the whole audience. 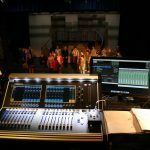 Paired with the quality of Lab Gruppen’s IPD1200 Amplifiers made the sound system suitable for a show like RENT. An onstage speaker was placed upstage to provide a little bit of foldback, but mostly for Qlab effects. The production heavily features an answering machine, which introduces a lot of almost fictional characters into the show. Roger and Mark of whom own the answering machine have recorded their own answering machine message (which was recorded during rehearsals) and so this speaker is used to localise their message back to the physical answering machine on stage. Some of the characters, also suffering from AIDS, have a ‘beeper’ that reminds them when they need to take their AZTs, this beeper is also localised through the speaker. A show as fast paced as RENT certainly required the show to be programmed through VCAs, the production features lots of one line solos throughout and normally in the middle of chorus numbers. At the end of Tech, the desk had 62 Scenes to swap characters in and out of VCAs as well as triggering tap delay for scenes involving a ‘digital delay’ machine. 12 Wireless Microphones were used on the production. 8 Beltpacks for the principles, 2 Roaming Beltpacks for Characters in the Chorus and 2 Wireless handhelds front of stage. Roger, Mark and Mimi’s beltpacks were kitted out with custom built headsets with DPA 4061 capsules. Roger, Mark and Mimi had a considerable amount of dialogue/singing throughout the show, and also through songs with heavy instrumentation. For this reason the feedback rejection and durability of the DPA4061s was a no brainer. Custom headsets were built using old CPC MP33908 Frames (with no mic on) and Fuse wire to extend the DPA4061 closer the the mouth and give it rigidity. Using fuse wire meant that the ‘boom’ lengths of the headset had to be exact as they’d not be able to be adjusted easily once taped to the frame. The rest of the belt pack microphones featured CPC MP33908 Headsets. These headsets, whilst not ‘west end’ quality, are very durable and easy to use for their price. With a bit of EQ wizardry you can expect a good, acceptable sound even for a headset microphone. Originally it was thought that the band would be on stage allowing most of the set to act as a screen as isolate the band, however due to technical reasons they were moved to the pit in front of the stage. This did have a detrimental effect on the isolation of the band, however during tech we were able to come across an agreement on levels (especially with drums) as well as erecting a carpet screen around the band to further isolate the acoustic sound from the reinforced sound.